Why Hike the Pohono Trail? This east-west hike along Yosemite Valley's south rim, going from Glacier Point to the Tunnel View (or, less frequently, vice versa), is a scenery smorgasbord, passing more points than a pincushion and giving you a bird's-eye view of everything that Yosemite Valley's famous for. Best Time to Visit: The trail is only accessible when the Glacier Point Road is open, typically from mid-May until early November, and there will likely be snow hiding the trail for the first few weeks after the road opens. Those restrictions aside, this trail is a gem anytime it's hikable. The waterfalls will be showier the earlier you go. Scenery Factor: A sockdolager. Along the way you'll pass Glacier, Taft, Dewey, Crocker, Stanford, and Inspiration Points, along with Sentinel Dome and the Tunnel View. You'll have views of all Yosemite Valley's great natural landmarks: Vernal, Nevada, Yosemite, and Bridalveil Falls; Half Dome, Sentinel and Cathedral Rocks, El Capitan, and more. You will have to slog through a less thrilling 4-mile stretch between Dewey and Taft Points where the trail veers away from the valley rim, though, and you'll only have intermittent glimpses of the valley between the various viewpoints. Crowd Factor: There will be lots of people at the hike's endpoints, Glacier Point and the Tunnel View. There will likely be a dozen or two hikers on Sentinel Dome and at Taft Point, a handful at Dewey Point, and only the occasional passerby everywhere else. Difficulty: High. No matter which trailhead you start from, you'll have a strenuous climb for at least a mile at the beginning of the hike. It gets easier after that if you're taking the Glacier-Point-to-Tunnel-View route, but if you're going the opposite direction, you'll also have a couple miles of climbing from Bridalveil Creek to Taft Point. Though neither direction is easy, starting at Glacier Point is the least difficult option. Parking: There are parking lots with frequent turnover at both trailheads; if your lot's full, do a lap or two and something should open up shortly. If not, let your passengers get out and start spreading rumors that bear cubs are signing autographs just up the road. 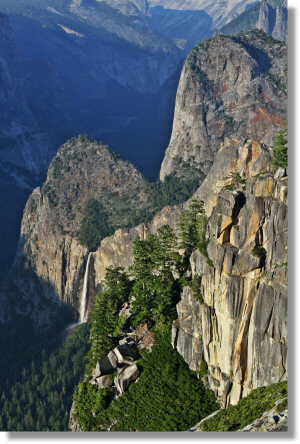 Nearest Bathrooms: From the Tunnel View trailhead, the nearest bathrooms are the pit toilets at the Bridalveil Fall parking area, two miles downhill. A series of pit toilets grace the Glacier Point parking area; the ones farthest from the trailhead will usually be the least fragrant, though you still might want to include a clothespin among your essential hiking gear. For the thirteen miles in between the two trailheads, you'll have to adopt the casual yet pragmatic all-the-world's-a-toilet philosophy championed by the area's native fauna. Possibly its flora, too; who can say what their underground bits are up to? Nearest Snacks: There's a snack shop/cafeteria at the Glacier Point trailhead, but it keeps limited hours. From the Tunnel View trailhead, try Yosemite Village, 7 miles east; the village store is open until 9 p.m. in the summer. A mile past that is the Ahwahnee Hotel, where the bar is open until eleven. Getting There: Assuming you're starting from Yosemite Valley, you'll want to take Highway 41 south no matter which trailhead you're seeking. Head toward the west end of the valley and follow the signs for Highway 41 and Bridalveil Fall. The Tunnel View is two miles up the road. If you're driving to Glacier Point, take Highway 41 nine miles (14.5 km) south to the Glacier Point Road turnoff, then take the Glacier Point Road to its terminus at Glacier Point, 16 miles (25 km) east. Trail Notes: The Tunnel-View-to-Glacier-Point hike is far more grueling than the reverse direction and should be avoided if you haven't climbed a staircase since you owned a slinky. The first two miles, from the Tunnel View to the valley rim, climb 2,000 feet. The two miles from Bridalveil Creek to Taft Point climb another thousand feet, and you'll also have a short but steep 400-foot climb to the base of Sentinel Dome (add another 300 feet if you choose to visit the top of the dome). If you're hiking in the opposite direction, your most significant climb will be the first mile, during you ascend 600 feet to the base of Sentinel Dome. The Pohono Trail generally follows the valley rim, but it does wander away from it for the four miles between Taft Point and Dewey Point, and the scenery trails off along with it. You'll also get only occasional views of the valley in between the various viewpoints (see the photos at the bottom of the page). If your timing is right, though, you will see vast threatening hordes of wildflowers. It will help you stay calm if you can identify them all; here's a Yosemite wildflower guide that can get you started. Hazards: The mile and a half or so of trail between the Tunnel View and Inspiration Point is rocky and uneven. You'll either be tired (because you've walked nearly 13 miles so far) or crazy (because you're doing the trail in the wrong direction) by this point. In the former case, at least, watch your step. A handful of stream crossings dot the trail to break up the hike and test your log- and rock-hopping skills, but it's all level-one stuff and you shouldn't get wet unless you really want to. You may find great clouds of mosquitoes blotting out the sky in the wooded areas, but they're generally scarce at the rocky promontories where you'll be stopping to take in the freaky views. Could it be that mosquitoes are afraid of heights? Transportation: There are people out there who can do the Pohono Trail round trip in a single day. They're too busy training for the Badwater Ultramarathon on their robotic legs to read this, though, so let's just assume you're doing the trail one way, in which case you're going to need transportation to your chosen trailhead at either the beginning or the end of the hike. Unfortunately, this may be the most complicated part of hiking the Pohono Trail. There are three main options: to provide your own transportation, to take the Glacier Point tour bus to Glacier Point and hike back down, or to hike up to Glacier Point and then take the tour bus back down. Option 1 (self-propelled): The most reliable option is to have at least two cars in your party, in which case you can park one at each trailhead and get everyone back and forth with a certain amount of shuttling. It will be even better if someone in your group needs a day off their feet and you can persuade them to drop you off at the trailhead, spend a day by the pool, and then meet you again at trail's end with a masseuse on each arm. If this isn't possible, you'll have to rely on the Glacier Point tour bus. It leaves the Yosemite Lodge at 8:30 am, 10 am, and 1:30 pm, drives to Glacier Point, spends half an hour or so there, and then returns, stopping at the Tunnel View on the way back if time permits. One-way tickets are $25 for adults, $23 for seniors, $15 for kids over five, and free for children under five. Round-trip tickets cost $41, $35, and $23, respectively; see the official details here. If you want to consult with a tour-bus expert and possibly reserve tickets, call the Yosemite Lodge Tour Desk at 209-372-1240; the people manning the phones at the number listed in the official link are generally not as well informed as the tour deskers. Option 2 (via bus): If you want to hike the far more strenuous uphill route from the Tunnel View to Glacier Point, you'll want to park at Glacier Point, catch the bus there for its return trip, then have it drop you at the Tunnel View to start your hike. There are two complications to this plan. The first is that you can't reserve one-way tickets for the tour bus's return trip; getting a ride on the return bus depends entirely on how many seats are vacant. This usually isn't a problem, because lots of people just take the bus up so they can hike down the 4-Mile or Panorama Trails, and consequently the return bus will be emptier than the going-up bus. It's not guaranteed you'll get seats, though; if you want a guaranteed seat, you'll have to buy a round-trip ticket. The chances of getting a one-off return-bus seat are better on the two earlier buses. The second complication is that the return bus only stops at the Tunnel View, your putative trailhead, if time permits. If the bus is behind schedule, you'll be stuck looking sadly out the window as the driver speeds past to drop you off at the Yosemite Lodge, six miles (nine km) from where you want to be. If this happens and you don't want to hike all the way to the Tunnel View and then up the Pohono Trail, your easiest route to retrieve your car from Glacier Point - aside from buying another bus ticket - is to take the 4-Mile Trail up. It's 4.7 miles (7.5 km), plus another mile from the Yosemite Lodge to the trailhead via the trail behind the lodge that crosses the Swinging Bridge. A sympathetic bus driver might be willing to drop you directly at the 4-Mile trailhead, as well - though it's not officially part of the service, they've done it for me before. Option 3 (via bus): If you're planning to hike the easier Glacier-Point-to-Tunnel-View route, you'll want to park your car at the Tunnel View, then catch the tour bus up to Glacier Point to begin your hike. This, alas, is the riskiest option of all. The best available scenario would be that at least two of you are doing the hike, so one of you can drop the other off at Yosemite Lodge to catch the bus, then go park the car at the Tunnel View. Meanwhile, the person boarding the bus can tell the bus driver to pick up the aforementioned parker at the Tunnel View. Officially, though, the Glacier Point makes no stops at all on the trip from the Yosemite Lodge up to Glacier Point. You might be able to persuade the bus driver to stop there, but the people at the Yosemite Lodge tour desk will categorically deny that this is possible, and you obviously shouldn't rely on it. This means that you'll have to park at the Yosemite Lodge, catch the bus to Glacier Point, hike the 13-mile Pohono Trail to the Tunnel View, and then figure out some way to cover the remaining six miles (nine km) between the Tunnel View and the Yosemite Lodge. You might try stashing bikes at the Tunnel View before catching the bus; you'd have a two-mile coast down the hill from the Tunnel View to Yosemite Valley, followed by four miles (6.5 km) of nearly flat riding to the Yosemite Lodge to pick up your car (leave the road at the Swinging Bridge parking lot and take the bike path that crosses the bridge; the path will take you right past the lodge). Or you could park at the Tunnel View and then ride your bikes down to the Yosemite Lodge to catch the bus. Or you could just keep hiking. If you can get back to the valley before 6 pm, you'd only have to hike about three miles, and could then catch the El Capitan shuttle bus at El Capitan Bridge; it will eventually take you right past the Yosemite Lodge (see the official shuttle map). As just mentioned, though, the El Capitan shuttle stops running at 6 pm. If you do end up hiking, don't hike all the way to the Tunnel View - the highway between the Tunnel View and the Bridalveil Fall is not particularly pedestrian friendly. Instead, turn downhill half a mile before the Tunnel View, where the Pohono Trail crosses the old stagecoach road. The old stage road (the intersection is well signed) leads down into the valley and merges with the main road a quarter mile shy of the Bridalveil Fall parking area, passing en route the spectacular Artist Point. Already done the Pohono Trail? Add a Review.